Tonight, for my very last lemon-thing-a-day, I made a lemon upside down cake. I had bookmarked several cake possibilities (which I will definitely have to try at some point in the future), but this one won out primarily due to the fact that I had the right number of eggs. 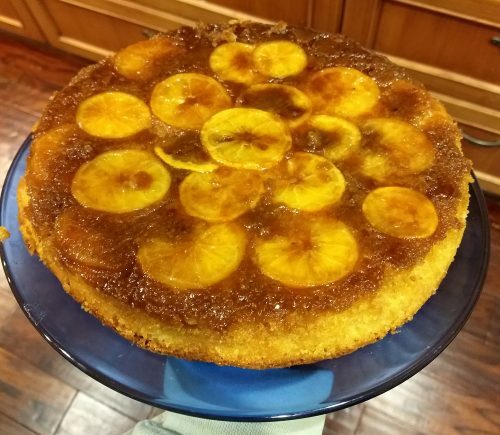 It is very much the classic upside down cake, except with a few twists. You start with a brown sugar caramel, which you pour into the pan. Then you layer thin slices of lemon in a pretty pattern, and top that with the cake batter. This particular recipe includes lemon zest and cornmeal in the mixture. That gets baked for nearly an hour, and then you are supposed to let it cool at room temperature for two more hours, except it was getting really late. So I stuck it in the freezer to speed things up a bit. Finally, you invert it on to a plate, and if all went well, your pretty pattern of fruit will come out with the cake and not be stuck to the bottom. This is a lovely, delicate cake. The cake itself is sweet, but you need that to counteract the bitterness of the lemon rind. Nice to end the month with a delicious success. Last night I made ice cream. Or rather, I *tried* to make ice cream. 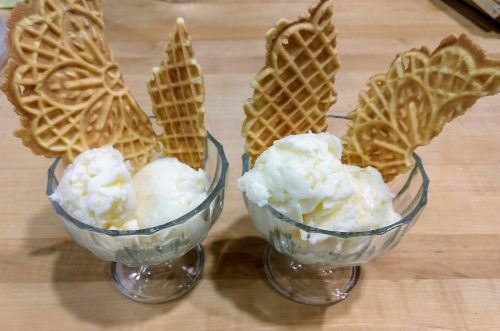 The ice cream maker base was thoroughly frozen, and all my ingredients (cream, milk, sugar, juice of six lemons) were thoroughly chilled, but it just churned and churned and never changed. So I poured it into a container and put that in the freezer and hoped for the best. Today I made lemon pizelles. Or rather, I *tried* to make lemon pizelles. The cookies themselves turned out just fine, it’s just that there is no lemon flavor at all. They don’t even smell like lemon. Luckily, the ice cream firmed up in the freezer, into something incredibly rich and delicious, and plain vanilla pizelles were the perfect accompaniment. I couldn’t get through an entire month of lemon things without making at least one pie. This is not, however, the lemon pie you are expecting. There is no meringue involved; just sugar, eggs, whole lemons, and pastry. Any time whole lemons are involved, there is the potential for the food to end up bitter. So the key to a Shaker Lemon Pie, according to everything I read online, is to make sure you slice the lemon very, very thin, and you give those slices lots of time to macerate in the sugar. LOTS of time. So this morning I sliced up 3 lemons as thin as I could, then tossed them in a bowl with the sugar, and left it to sit all day. This evening, I made the pie crust, then finished up the filling, and popped the pie into the oven. A couple hours later, after it was baked and then thoroughly chilled, we gave it a try. You can see bits of the rind peeking out. And please look at that crust. This is the first time I have made a pie crust that actually came out nice – not only in taste, but in appearance. Yay, perhaps the long, dark night of pie crust woe is finally over! But I digress. How was it, you ask? Really, really good. The filling borders at the edge of too sweet… until you get a little sliver of the rind to even things out. 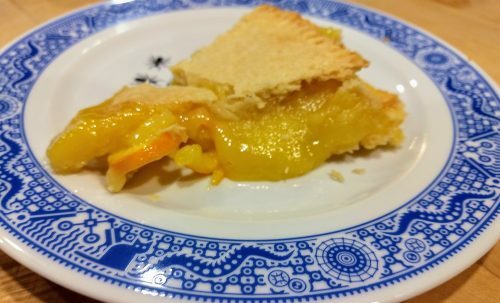 It’s definitely a rich tasting pie – I wouldn’t want more than a small piece at a time – but I could definitely see making this again. Last month, for our monthly #BakingSisters video hangout, my sister and I made Smearcase, which is this sort of weird hybrid between a Danish and a cheesecake and something else, and as we were chatting, she suggested that we do a Year of Cheese. Naturally I agreed, because cheese, so this year, every month we will do some sort of cheese-related baking. And this month’s theme was pizza. Naturally, both of us has made pizza a bazillion times before, so the challenge here was to find things we hadn’t tried. My sister decided to do, among other things, a sweet apple pizza with a cheddar crust, pizza rolls, and a Chicago style pizza. I, meanwhile, decided to also make the pizza buns, but along with those, I also made bacon, egg, and hash brown pizza, sausage, apple, and thyme breakfast pizza, and, because it’s lemon month, a roasted broccoli and Meyer lemon pizza. To prepare for this, I made a double batch of my regular pizza dough, which then goes into the fridge for a slow rise. Thankfully, the dough was finished mixing before this happened. 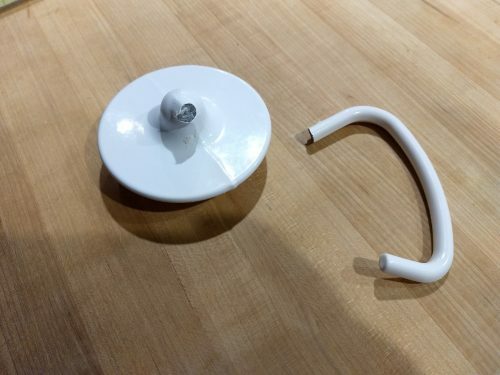 Yes, that is my dough hook, snapped in half. Luckily we live in a time when replacements can be ordered via phone, so a new one is winging its way to me, and the longest part of the process was trying to figure out where the heck they put the model number on my mixer. Phew. Anyway, onward to the food! First up was the hash brown, bacon, egg thing. 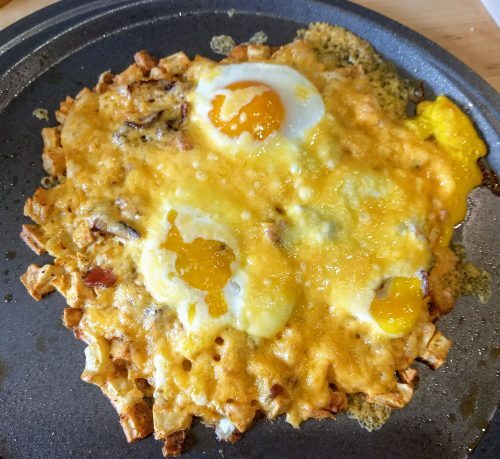 I cooked up some bacon, then mixed hash browns with an egg and formed it into a rough circle. That went into the oven to bake, and when that was done, I sprinkled it with crumbled bacon, and carefully cracked three eggs on top. 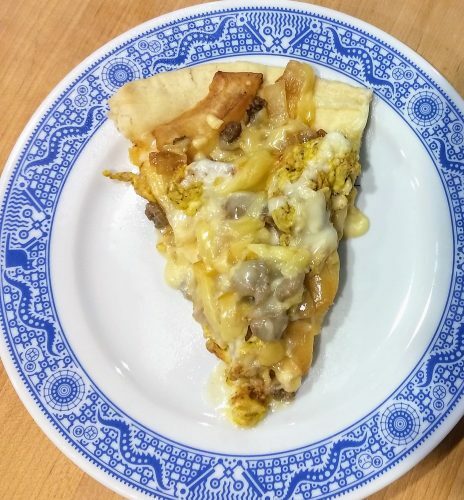 The whole mess was topped with cheese, and back into the oven it went. Verdict: it tastes fine, but it’s an awful lot of fuss for just some eggs and hash browns. 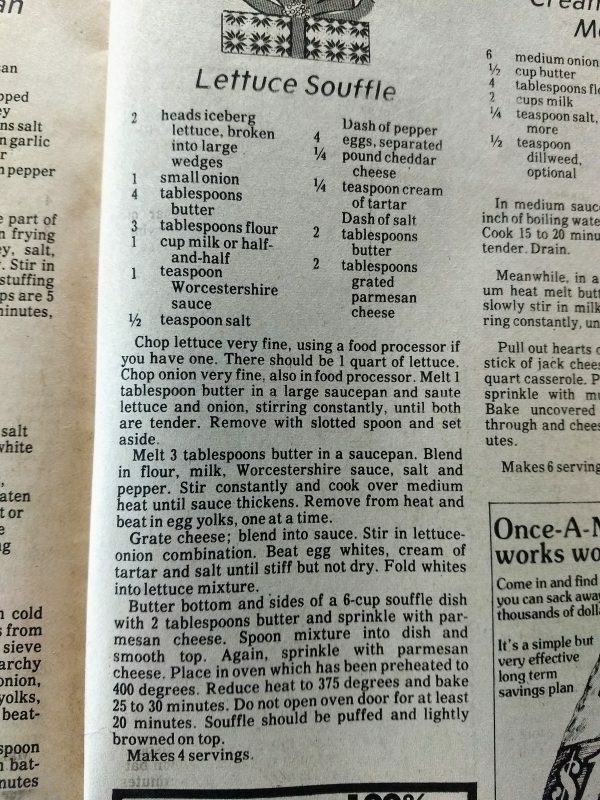 Save yourself the bother (and all the extra dishes to wash) and pass on this one. While this was baking, I got started on the apple, sausage, thyme pizza. For that, you cook thinly sliced apple and onion, and scramble some eggs. These get piled onto a pre-baked crust which has been brushed with a mix of mayonnaise and Dijon mustard. Top that with crumbled sausage, and a mix of mozzarella and smoked Gouda, then pop it back into the oven until the cheese gets all melty. You will note how I forgot to mention the thyme? Yeah, guess what I forgot to add to the eggs when scrambling them. But it turned out delicious anyway. I thought I took a picture of the whole pizza but apparently I didn’t, so here’s a slice. This is going to be breakfast for the next couple days. Yum! 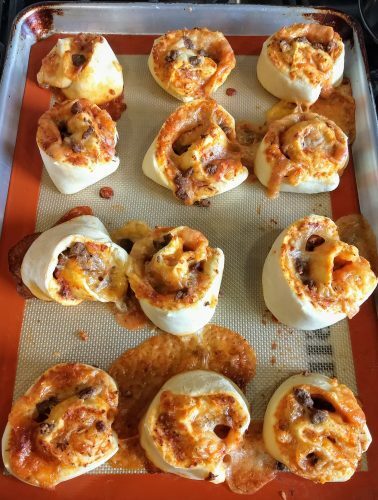 On to the pizza buns. The concept is simple. You pretend you are making cinnamon rolls, except using pizza dough and sauce and toppings instead of sweet dough and butter and cinnamon. If I ever make these again, I will probably bake them in a pan where they will be holding each other up, because these clearly didn’t hold their shape. As for the taste, well, it’s pizza. In a roll. I’m not sure what else there is to say. As for the last pizza, I admit I was just as skeptical as you probably are. 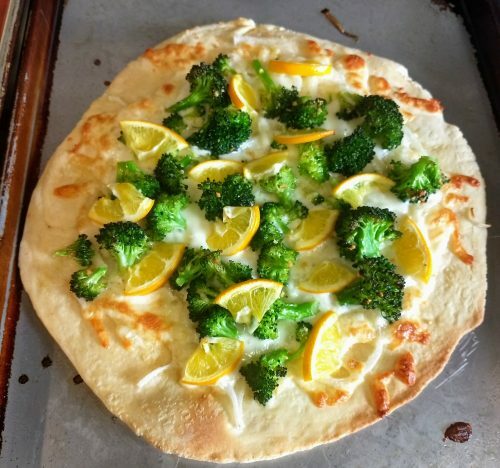 Broccoli and lemon on a pizza? But trust me, it really works. You brush the crust with a mixture of minced garlic and oil, then top it with thinly sliced onions, tiny broccoli florets tossed in the remaining oil, thinly sliced pieces of whole (yes really) lemon, and a sprinkling of mozzarella cheese, then bake until the crust is done and the broccoli is just starting to get some color. Verdict: this was surprisingly tasty. In fact, I actually have to admit it was my favorite of all the pizzas I made, and I liked that apple sausage one a lot. I would happily make this one again. I had my decorating class this morning (we are playing with gumpaste, and it’s a lot of fun), and I performed in a concert this evening, so I knew today’s lemon thing would have to be quick. So what better thing to make on a cold, damp, winter day than soup? This soup has exactly 4 ingredients: chicken broth (you could easily substitute vegetable broth to make it vegetarian), orzo, lemon juice, and eggs. The eggs are separated, and the whites whipped separately, before folding the yolks and lemon juice back in. 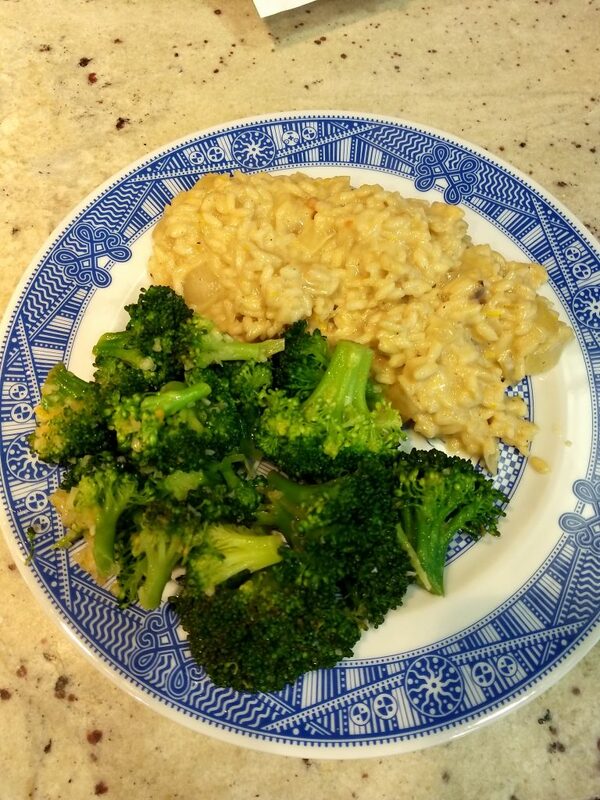 You then slowly incorporate boiling broth (in which you’ve cooked your orzo) to bring the egg mixture up to temperature, then blend the whole mess together, being careful to stir constantly, so as to avoid random bits of cooked egg. 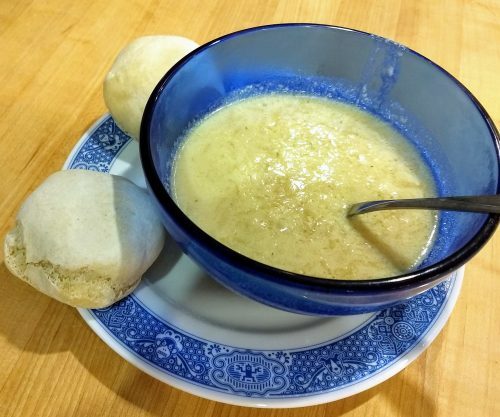 It is an odd looking soup, but it is incredibly delicious, for something so simple. This is one I will happily make again. A couple recipes over the past week have involved egg yolks but not egg whites. I suppose I could have done something with meringue again, but been there, done that this month. So instead, today I took a couple of those leftover whites and turned them into marshmallows. 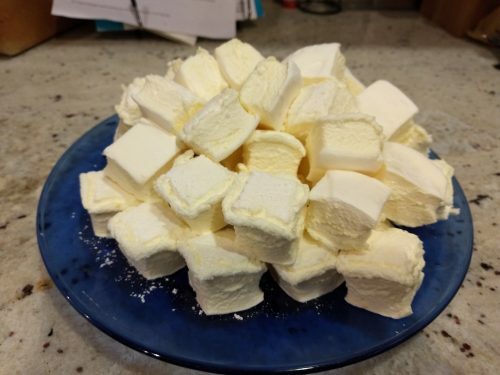 Making marshmallows is actually very similar to making meringues, in that you start with a boiling sugar syrup, which is poured slowly into well-beaten egg whites, then whisked until smooth and fluffy. But where things differ is that marshmallows also require gelatin, in order to hold their shape. So instead of juggling two separate things (egg whites in mixer; syrup on stove), you are juggling three (egg whites in mixer, syrup on stove, gelatin soaking in tiny pan). All three eventually come together, and then you pour the whole mess into a foil-lined pan which has been well-sprinkled with powdered sugar and cornstarch. Those sit out to dry overnight (or in my case, all day, since I made them this morning), and then you turn the block out onto a well-sugared board and cut them into pieces. But what, you might ask, does one then *do* with a pile of lemon marshmallows? Well, how about lemon marshmallow s’mores? We tried a couple variations, all in the name of science. We used saltines instead of graham crackers, because I figured they would need the little kick of salt. And instead of dark chocolate, we tried two different things: white chocolate, and lemon curd. The combination of marshmallow, saltines, and lemon curd was a definite hit – as long as we didn’t go overboard with the curd. But the white chocolate just didn’t do it for us. Maybe if the chocolate had melted a little, it might have been better, but… eh, someone else can give that a try. Oh, and in case you were wondering, homemade marshmallows do not toast up like store bought. 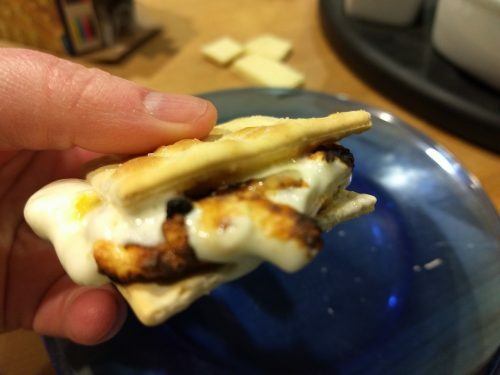 They have more of a tendency to just melt, without getting that lovely outer shell that a regular toasted marshmallow achieves when you introduce it to flame, and they do that at much lower levels of heat (which is probably one reason why the white chocolate didn’t melt). Today’s lemon thing is quite possibly the weirdest one for the month, but when I stumbled across the recipe, I knew I had to try it. And now none of you have to, because I fell on that sword for you. You’re welcome. So what is this weird thing, you ask? Fondue. Lemon fondue, to be exact. It sounded like such an intriguing concept, and it seemed pretty straightforward. Water, sugar, cornstarch, lemon juice and butter. I figured it would be a bit like a lemon curd. What could possibly go wrong? Ha. First of all, it was really runny. Sure, the cornstarch-sugar mixture thickened, but not very much, so that at the end, we were left with this anemic slightly sweet lemon water sort of concoction. 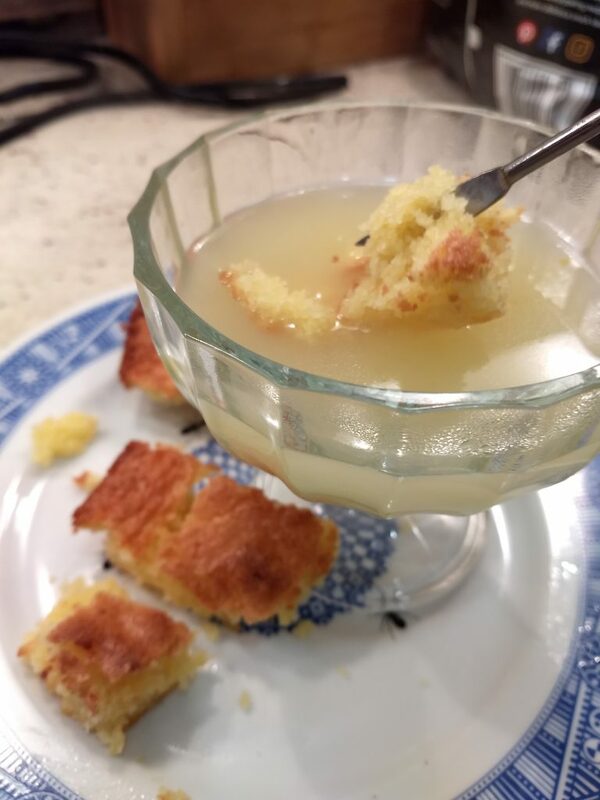 As for what to dip in the fondue, I have this recipe for lemon pound cake, and pound cake goes well with sweet fondue, and I have made it several times before with no issues. But this time the cake crumbled into bits once I tried to dump it out of the pan. Mmm, doesn’t *that* look appetizing. Oh, we did try to make this work, carefully dipping chunks of cake into the runny lemon stuff, but….yeah, no. Ah well. At least the cake was tasty, even if it was in pieces. Total lemons this month: 36. While making the ravioli yesterday, I got frustrated with how poorly they were turning out, but there was still a lot of dough left. So instead of fussing about with more of the stupid ravioli, I turned it in to spaghetti. 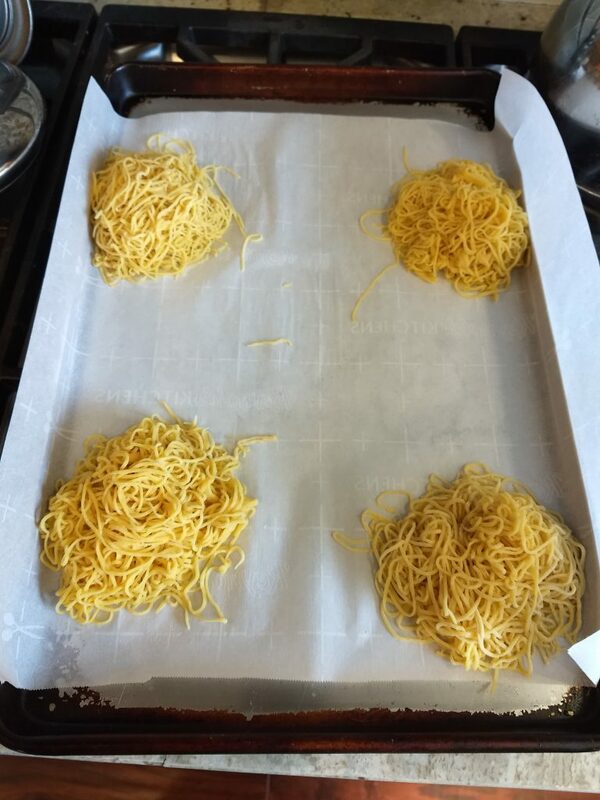 It turns out spaghetti is super easy to make if you remember to flour the dough in between each step of feeding it through the pasta roller (it’s also far less likely to clump later). Coincidentally, guess what I *didn’t* do when assembling the ravioli. Hmm, I am sure there is no connection to how those turned out. Four servings of fresh pasta. This ended up being the perfect accompaniment to tonight’s lemon-themed dinner, which was Lemon Chicken Piccata. This was a pretty simple dinner to throw together. Chicken is cut into smaller pieces, then dredged in flour and pan fried. 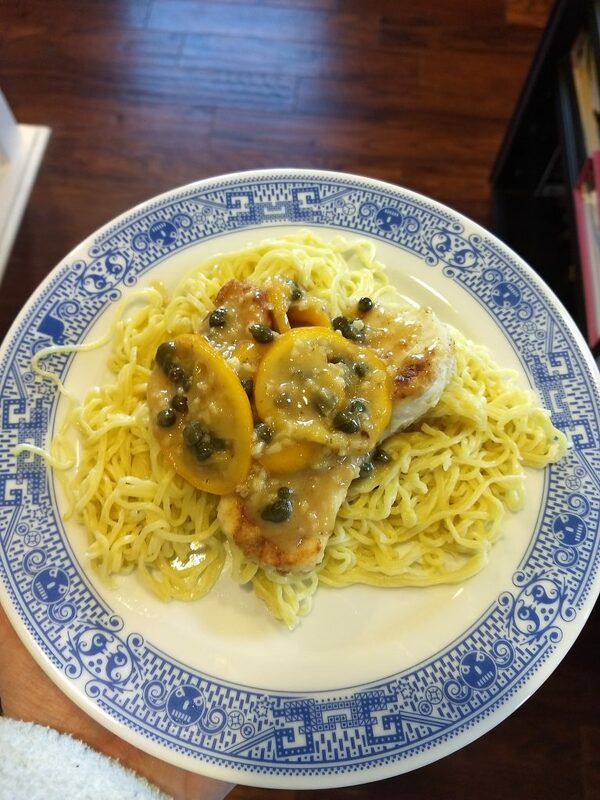 Then you make a sauce of lemon juice, garlic, and broth, which is finished off with butter and capers. 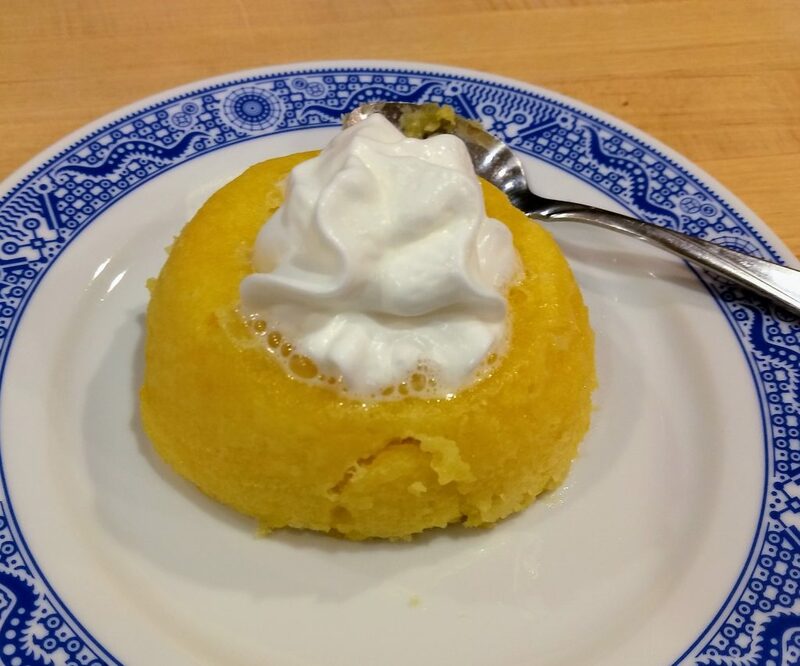 We followed this rather delicious dinner with a bonus lemon thing – Lemon Mug Cake. I’ve made that before, and it’s a lovely way to use up another lemon, and to end a meal. Today is President’s Day, and for the first time in more than a decade, I actually had the day off. So I decided to celebrate by making something fiddly and time-consuming (because this is what weird people like me do for fun): I made ravioli. 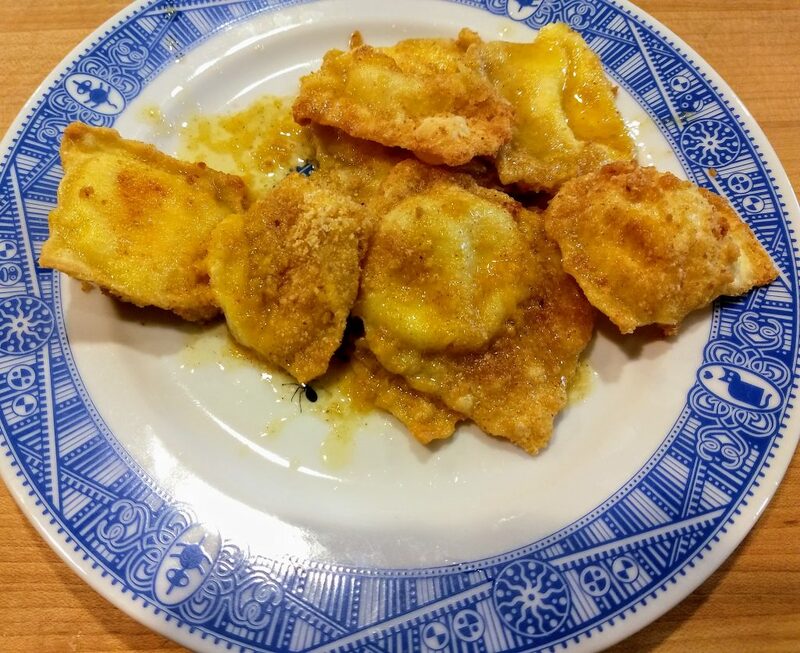 I was feeling pretty confident about this because last year’s tortellini turned out so well, so surely ravioli wouldn’t be that big of a deal. Yeah…. let’s just say it didn’t go as well as expected. Making the dough was easy – just follow the directions. Then I mixed up the filling, using the remains of that underwhelming lemon cheese I made earlier, and I started rolling out the dough and that’s where things started to get a little tense. The dough kept tearing, the filling was probably too runny, and I am apparently completely incapable of cutting out uniform raviolis. Plus I am pretty sure that not a one of these sealed completely on the sides. 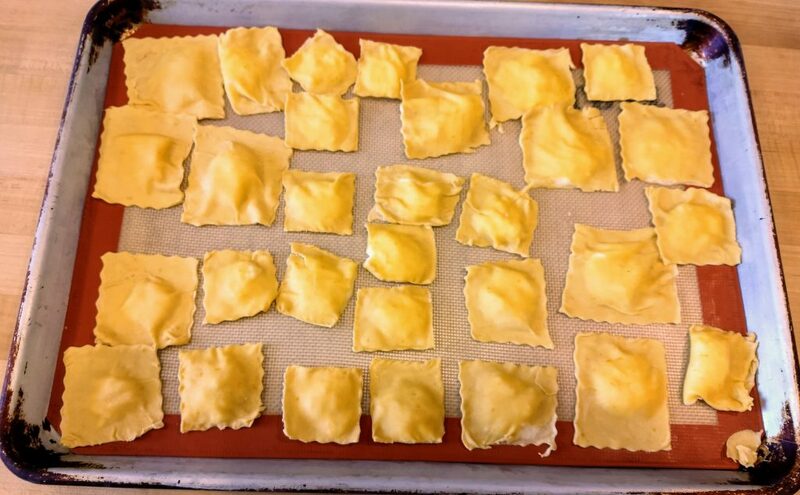 Shh, it’s not that I can’t make ravioli; it’s that they are…uh… rustic. I let them dry and then popped them all into the freezer. And then, because I was worried they would all just burst open in the boiling water, I decided we should try baking them instead. So half of them got coated in bread crumbs and tossed in the oven for about 10 minutes, and then we had that for dinner with the lemon sage butter sauce from the original recipe. I think that on their own, or maybe with a simple red sauce, they would have been fine. And the sauce by itself, with some plain pasta, would have been fine. But the combination of the two was just not that great. On the plus side, though, they used up two more lemons, so at least there’s that.